If you’ve sustained a back injury anywhere in Florida, contact this Miami Spinal Accident Fusion Lawyer today. A spinal fusion is a type of surgery frequently performed to treat a back injury. Unfortunately, it can leave a patient with debilitating restrictions and limitations. 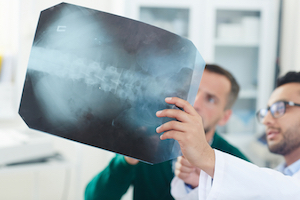 During a spinal fusion procedure, your doctor will remove one of your intervertebral discs. Your intervertebral discs are located in between the vertebrae in your neck or back. The vertebra are the bone-like objects that you feel when you run your finger down your back. Intervertebral discs serve to cushion the vertebrae. Without the intervertebral discs, the vertebrae would rub against each-other and cause injury. However, with the intervertebral discs in place, the vertebrae are cushioned and injury is prevented. After you’ve been injured in an accident, fluid from one of your intervertebral discs may leak out of the disc. This is referred to as a disc herniation or herniated disc. Such an injury is significant because the intervertebral discs are located close to the spinal cord and spinal nerves. If fluid from the leaking disc presses or impinges on the spinal cord or spinal nerve (in a condition referred to as “cord compression), it can cause severe symptoms for the injured person. If the chord compression is bad enough, then paralysis could even result (rendering the injured person a quadriplegic or paraplegic). A fusion procedure is designed to alleviate the injured person’s symptoms. During such a procedure, the injured intervertebral disc is actually removed from the spine and bone is inserted in its place in order to “fuse” the adjacent vertebrae. Sometimes, “hardware” (in the form of plates and screws) will be placed in the spine in order to hold the fused bone together and allow it to heal. Since fluid from the herniated disc/disc herniation is no longer impinging on the spinal cord or spinal nerves after the fusion procedure, the idea is the patient will no longer experience the negative symptoms from the herniation. Fusion procedures can be performed on either the neck or the back, depending on where the herniated disc/disc herniation exists. Should you undergo a fusion procedure as a result of an accident anyplace in the State of Florida (including Broward County, Fort Lauderdale, West Palm Beach and Palm Beach County), contact Mr. Quackenbush at 954-448-7288. This Miami Spinal Fusion Accident Law Firm can help to get you the compensation you deserve. Call Mr. Quackenbush to discuss your case today. If you have herniated discs/disc herniations at multiple levels of your neck or back, your doctor may choose to perform a multi-level fusion. This procedure can be effective in eliminating symptoms such as pain, but it can also lead to severe restrictions/limitations in mobility (i.e., you might not be able to flex or extend your neck/back as much as you could before the procedure). Additionally, once a level in your neck has been fused, you may have heightened risk for degeneration/arthritis at the other, adjacent levels of your neck. This is because added pressure is then put on the other, adjacent levels to allow for neck/back movement, and this can lead to degeneration/arthritis at those levels. If your degeneration is bad enough, you may require fusion procedures at the other levels of your neck or back. After undergoing a spinal fusion procedure, you may be left with severe restrictions. These may include less flexibility/ability for movement in your neck or back. The reason for this is that it is your intervertebral discs that allow for movement in your neck and back. Once a disc has been removed in a spinal fusion procedure, the disc no longer exists to allow for movement. As such, after a spinal fusion procedure, you may have less of an ability for motion. Degenerative changes are something we all experience as we get older – it is commonly known as “wear and tear” and is part of the aging process. In your case, the defense may try to argue that the symptoms you’re experiencing after your accident are actually related to degenerative change rather than being “acute” (i.e., from the accident). Mr. Quackenbush will then have to prove that your symptoms are actually from your accident and not simply from normal wear-and-tear caused throughout your life. Additionally, you can have both degenerative change and acute injury. In fact, sometimes an accident can aggravate pre-existing, degenerative change. For example, you may have degenerative change that is asymptomatic, then you are in an accident, and you now begin to experience symptoms. In this case, you are entitled to compensation for the new symptoms. The law says that, if you are in an accident that aggravates a pre-existing condition, you will be entitled to compensation for that accident/injury. Indeed, the law says that the person who causes an accident “takes his/her victim as they are” – meaning, if you cause an accident and cause injury to people with pre-existing conditions, you are responsible for those aggravations. You don’t simply “get off” simply because the people you injured had pre-existing conditions. If you’ve underwent a spinal fusion procedure due to an accident taking place anywhere in Miami-Dade County (Coconut Creek, Cooper City, Coral Springs, Dania Beach, Davie, Deerfield Beach, Hallandale Beach, Hollywood, Lauderdale-by-the-Sea, Lauderdale Lakes, Lauderhill, Lighthouse Point, Margate, Miramar, North Lauderdale, Oakland Park, Parkland, Pembroke Pines, Plantation, Pompano Beach, Southwest Ranches, Sunrise, Tamarac, West Park, Weston and Wilton Manors), contact Mr. Quackenbush at 954-448-7288 to discuss your case at no charge to you.